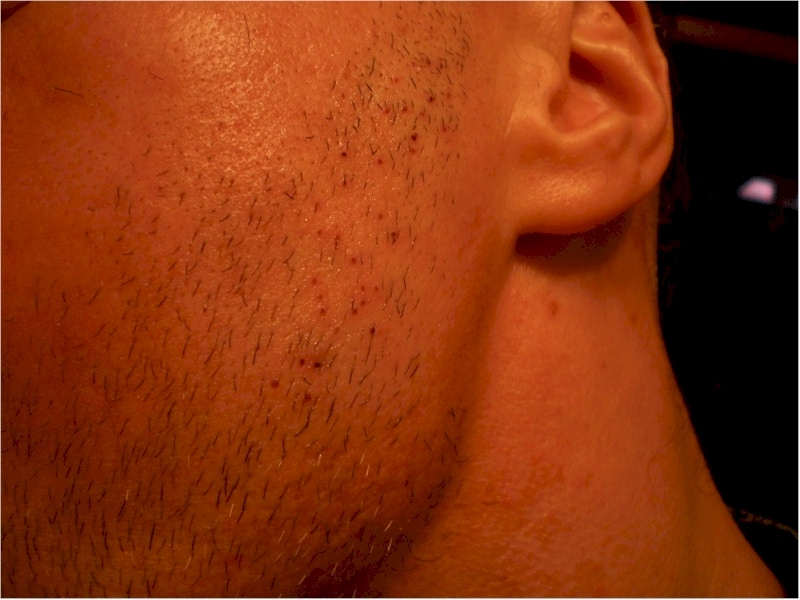 would like to thank dr bisanga, philb and stephonl and great technicians and staff for donating their valuable time and expertise, here are a couple pics 2 days post that show my rapid progress, had a few test hairs taken from my beard and my healing is quite rapid due to the very small incisions made by doctor bisanga, unfortunately i have alot of scarring that i need to conceal and i was only able to get 448 grafts mostly from the sides, and a few from the upper nape, he felt i could have a 5cm strip which would have given me a desperately needed approx 300 extra grafts but i decided against it, not sure if that was the right choice however, there generousity as of yet is unmatched as is their quality of work evidenced here, placed where we think it would have the most cosmetic benefit, again thanks to bhr! What about the photos in your journal profile? Perhaps the files you uploaded show up there? 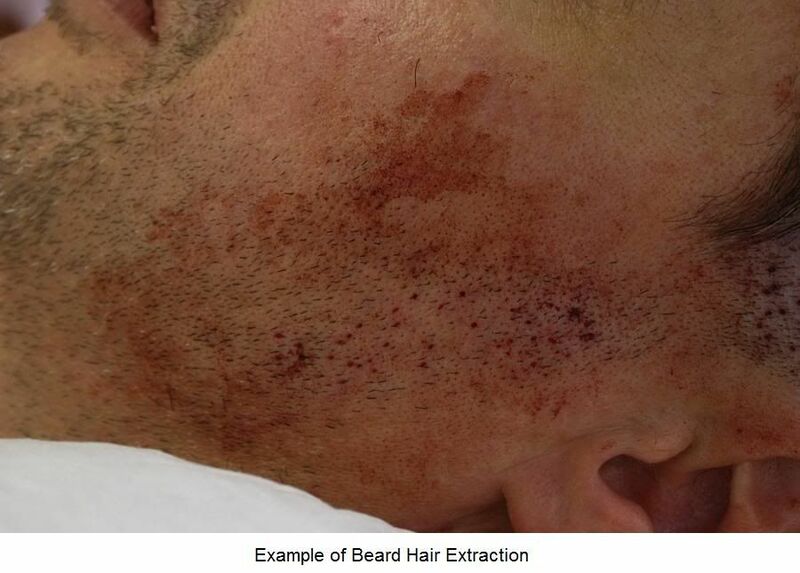 Clearer or bigger photos would be good, it’s hard to see the effect of the beard hairs. Hi Scarred, hope you are well, looks like the healing post op is good. 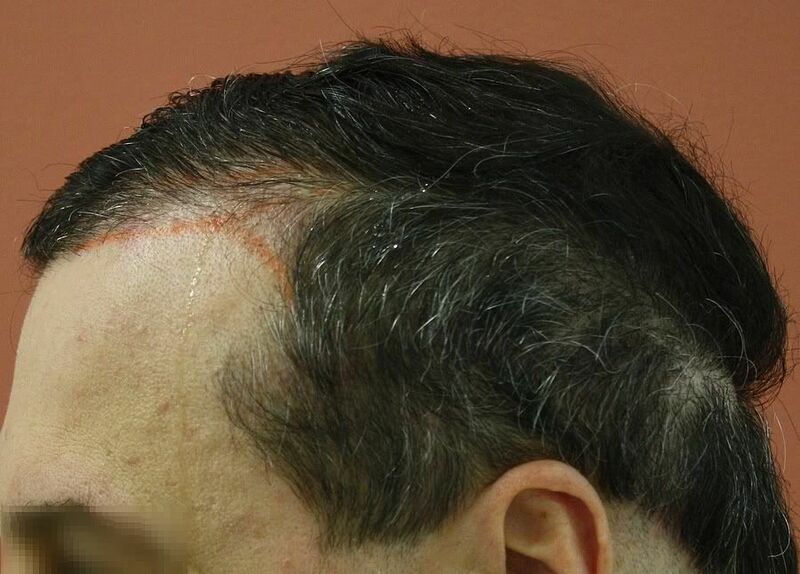 As most of you have probably read Scarred has had something like 20 procedures and several scar revisions. His hair characteristics are salt and pepper with around 40-50-60 density of follicular units per cm2 dependent on the area of the scalp. We discussed at length the day before and the morning of the procedure what were Scarred’s main concerns, where his priorities lay and what long term was realistic and achievable. Some were a reality check for Scarred but it was important that he understood what was available now and future. 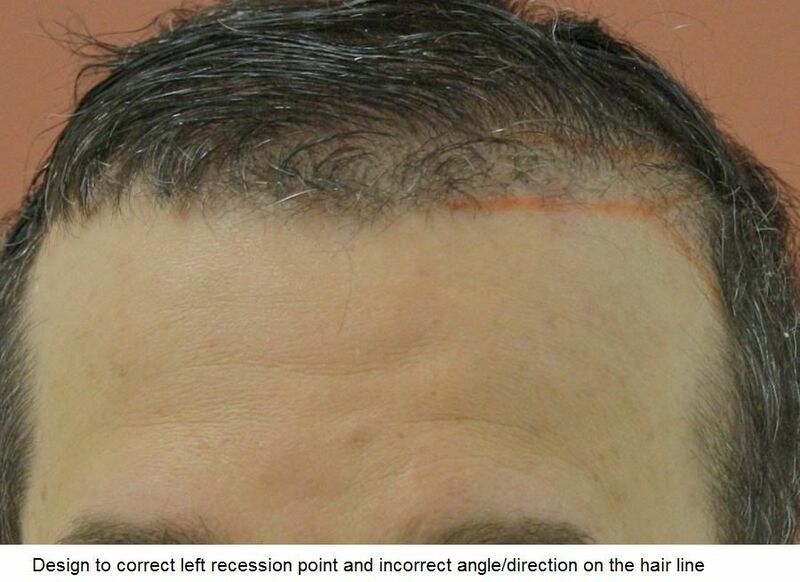 The main areas of concern for scarred5 was his hair line, temple angles/connecting to the sides and the frontal 1/3. 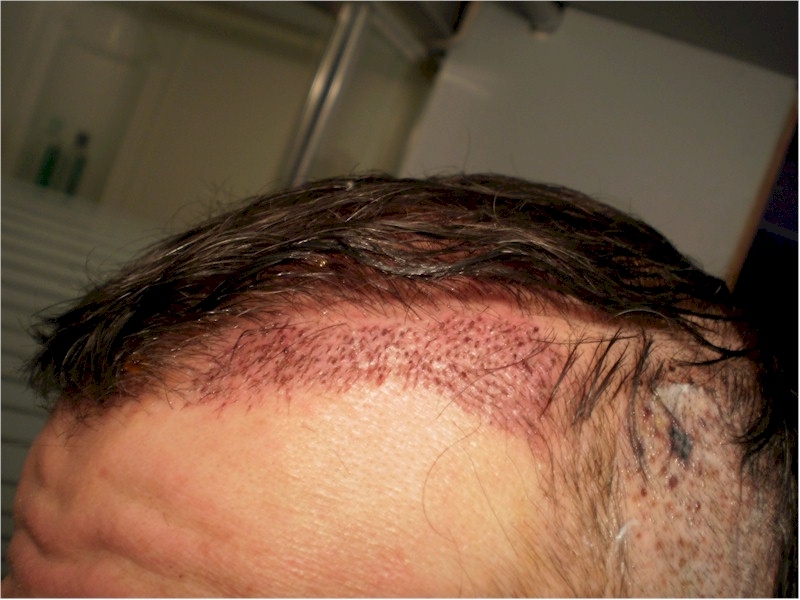 His scarring in the donor he has been treating so it was not priority for this procedure. 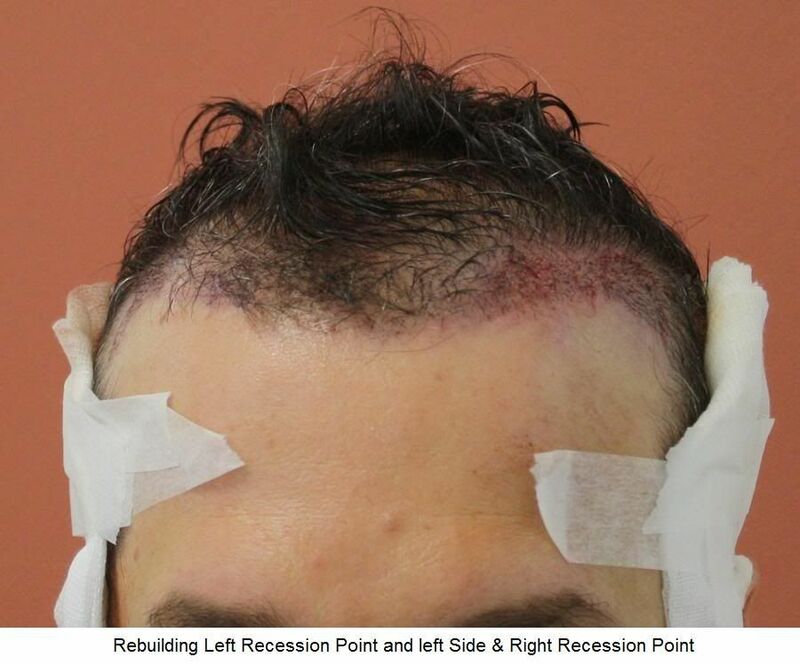 The occipital area and generally the back of the scalp was not open to harvesting due to covering the existing scars in the area leaving only the sides available, so realistically with the limitations of surface area and density very little donor. 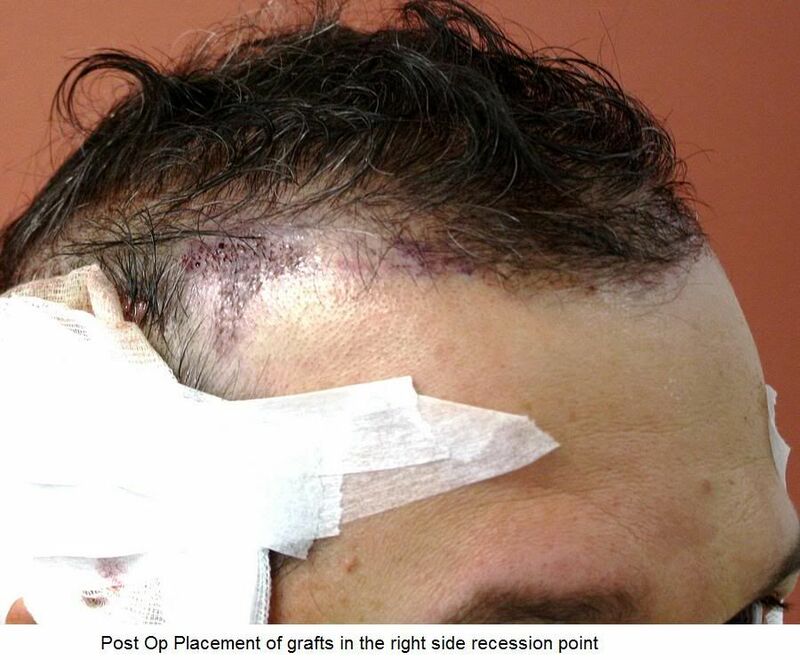 Dr. Bisanga shaved down the sides and felt that safely he could extract somewhere in the region of 300-400 grafts; the left side being careful to avoid the scar area already filled by grafts from a previous procedure. A strip was an option but Scarred (with some understanding) declined this at this stage. Dr. Bisanga assessed the shaved nape but felt the hair quality was just too fine and miniaturised to make them viable to use. The result was to treat the left and right temple angles and recession points, as well as the left side addressing directional problems; this would allow for better framing of his face and natural angles and directions of hairs in the hair line and temples. 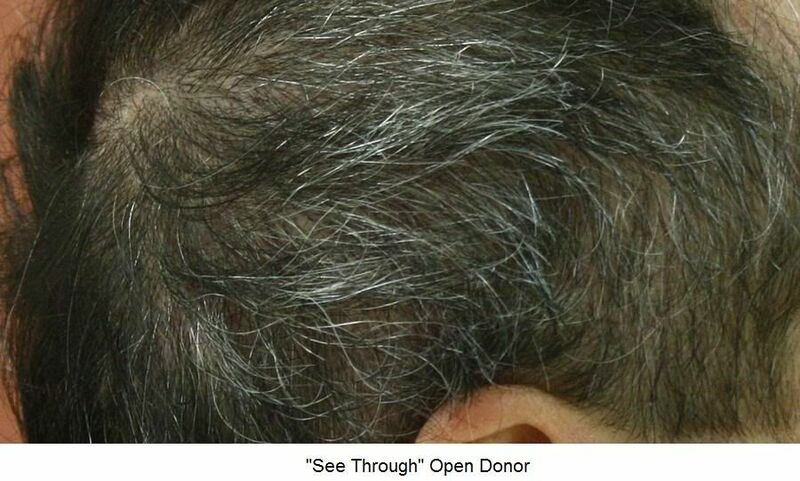 hey stephon, unfortunately i went to some subpar clinics and used up precious donor with no results, if i had been patient and waited i think i could have had more hairs available from the donor dr bisanga utilized, im healing exceptionally quick because the recipient and donor sites are so small, the work and clinic are exceptional, although my beard area is limited i hope to return in the future to see how i can enhance my result further, i have realistic expecataions as im no longer a spring chicken thanks for posting my pics you bloke! Scarred5, my experience from having work done with so many dishonest and unethical doctors has left me left me very leery of seeking out any additional type of repair work. I know you have been basically been around the country and the world trying to find some resolution to your situation. How do you rate your experience as far as how ethical and honest the clinic was during your visit? The work speaks for itself. 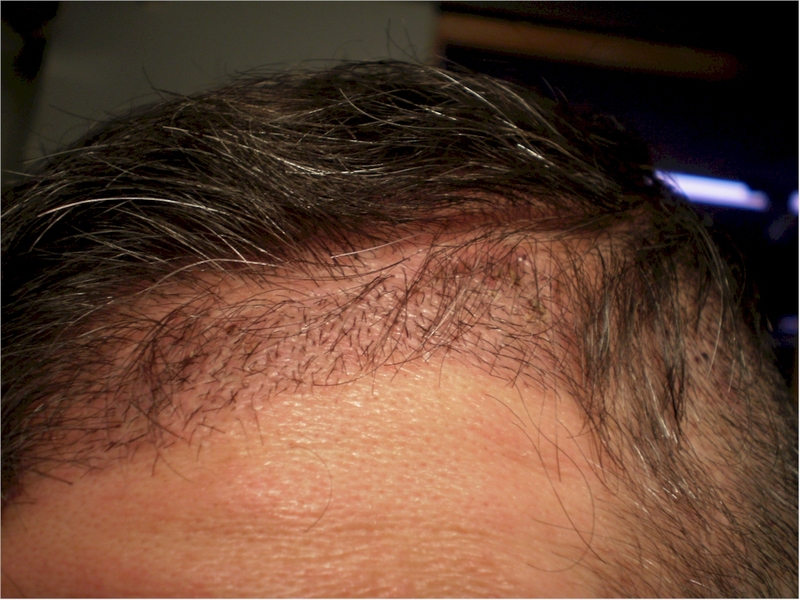 The hairline is usually the dead give away for being noticed as having a hair transplant. 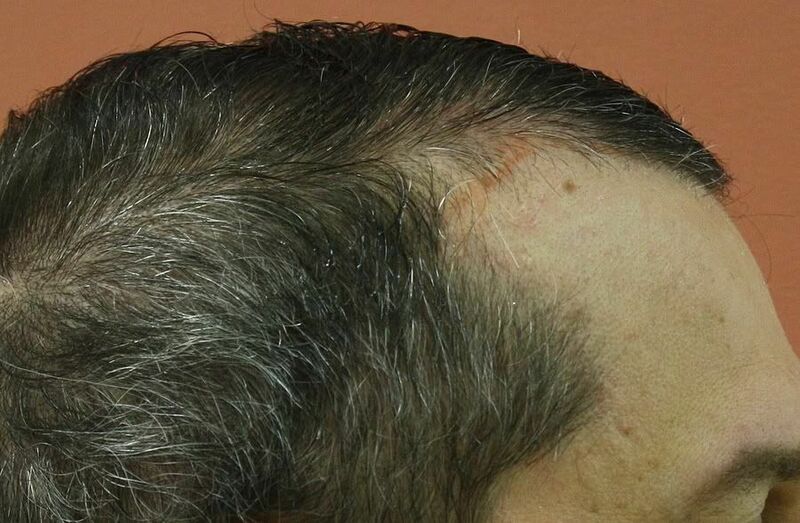 Dr. Bisanga is one of the few doctors that has the artistic ability to give someone a hair transplant that looks like a natural head of hair. After so many consultations over the last 10 years, along with reading and posting on the forums, BHR was the first clinic that made me feel like I was making the right decision. I hope that I am right this time and I hope I’m not too far gone to see some type of improvement. 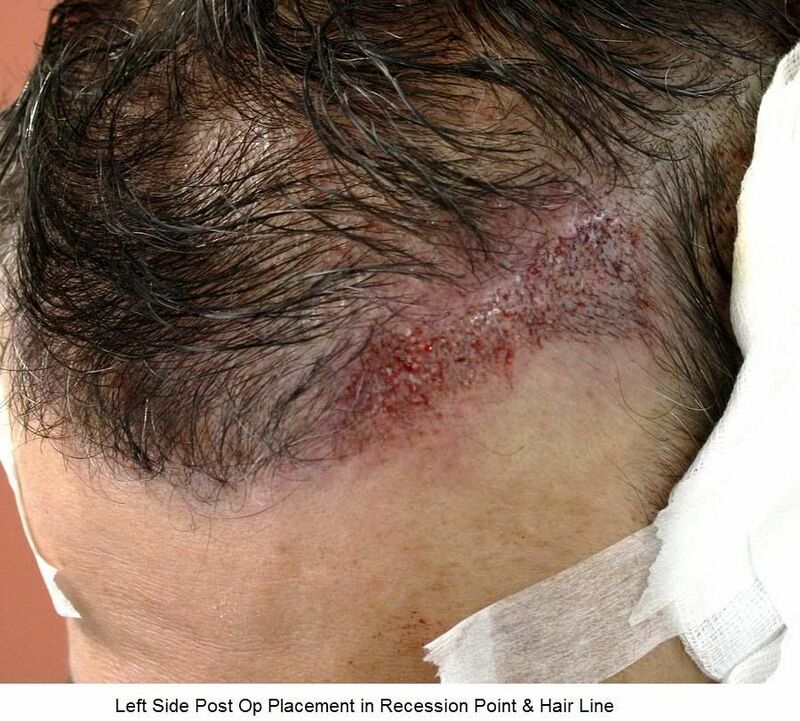 Scarred the area on the sides of your head where the fue’s were extracted looks very good. I am surprised that the hair wasn’t shaved down closer. It sure makes it easier, not having to wait so long for the surrounding hair to grow back. i was surpised bout that to, others have usually shaved it right down, it is nice, this is also one of the reasons i didnt do more beard, i shaved the day b4 i went, so when r u going and how much do you plan on having done? I am scheduled for 1/11/10. I would like to get as much work done as possible. But I really don’t know what’s possible until I get there. I would like to try some body and beard hair, but I also would like to see how it’s going to heal. Yes, I hope I have enough head donor to make a difference, but I am realistic. I will also be doing a beard and bodyhair test, and hopefully that will go well. I plan on staying for a few days, so I don’t think the time difference will be a problem. I do not eat restaurant or take out food. From what I can see there should be some grocery stores in the area. As long as I can purchase some fresh fruits, vegetables, and nuts I will be happy. I can live without eating meat for a few days if it is necessary. I know it’s not easy having to travel so far, but it’s more important for me to have confidence in both the clinic and the doctor. definitely in the right hands, no one on this planet more qualified not to mention generous,not just the doc but everyone at the clinic, and thanks for the kind words hairtech! » that will go well. » will be a problem. » meat for a few days if it is necessary. » me to have confidence in both the clinic and the doctor. I had a consultation with Philb and Dr Bisanga in Belgium a while ago. They gave me the straight goods - which was that I wasn’t a conventional HT candidate ecause my virgin donor area was so bad - not what I wanted to hear of course but they didn’t bulls**t me or try and get me to do an ill-judged procedure, so they were entirely ethical. I wasn’t that surprised by their assessment in the end and I am sure it was right - they are not the only consultation I have had of course. One other thing - they came in on a weekend to assess me and didn’t charge me anything for their time. I thought that very impressive too. » are not the only consultation I have had of course. » me anything for their time. I thought that very impressive too. You said you had other consultations, did they all say the same thing about your donor? I just had one consultation and that was free of charge too, I guess it is pretty common for doctors not to charge for their consultation time. Yes, they all said pretty much the same thing, my hair loss was aggressive - if it is aggressive or early I think it is often the case. One or two wanted to do work on me but couldn’t deliver the minimum sort of result I was after. That’s because I believe that ‘Framing the face’ and leaving a whacking great bald batch behind is purely a ‘mirror illusion’. The problem is to everybody else who see you from all sorts of different angles I think it just looks bllx. 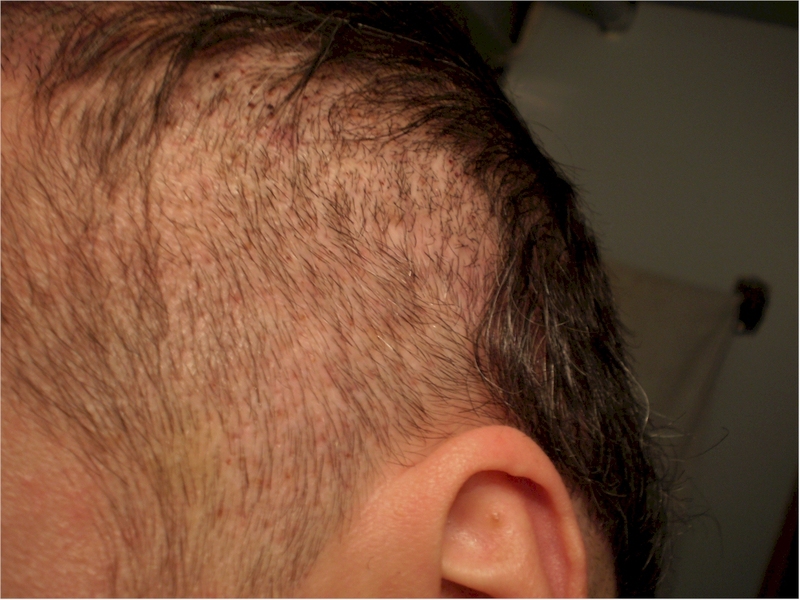 I didn’t know about Finasteride but frankly even if I did I am not sure I would have taken it, I think the side-effects of Finasteride are massively under represented (just my opinion). I tried Minoxidil but I got unacceptable side-effects. I believe there are millions of guys out there with my cr*p quality donor area. Not all of my consultations were free and nobody else came in for free on a weekend specifically just to see me.